Quincy's Farmer-Consumer Awareness Day (FCAD) started in 1981 when Dennis Higashiyama was listening to the radio. He heard a story on the Paul Harvey show that illustrated how farmers and consumers had drifted apart - leaving many people with little or no understanding about how food actually arrives on their grocery store shelves. For farmers, FCAD is an opportunity to show off the fruits of their labor and demonstrate the tools and techniques that they use in their work. For the public, it's a great way to learn about where your groceries come from and to talk to the people who grow them for a living. Over the past 37 years, the event has grown successfully with tours of area processing plants and farms, displays of farm equipment, informational and commodity booths, and a farmer's market. The celebration has been expanded to include the Grand Parade, the Farm to Market Fun Run, live entertainment, cook-offs, arts and crafts, a car show and booths that showcase locally grown delicacies. Though they're based out of the rainy Pacific Northwest, The Weavils have sure tapped into the sunshiney spirit of American roots music. On their most recent album, Starlight reel, their music channels the many strains of Americana, from the rapid-fire picking of bluegrass to the old-time string band tunes of Appalachia, and from the country twang of Jimmie Rodgers to the engaging songwriting of Tom Waits and John Prine. This is folk music done right, the kind of music you'd be proud to bring home to your parents (just mind the furniture if they're actually playing in your parents' house). And that's because The Weavils is essentially a circle of great friends, brought together by a love for hot picking, cool tunes, and getting audiences on their feet. It's the same love that's driven folk bands since time immemorial, and it's this love that shines through on their new album, Starlight reel, and during their live performances. Each member of The Weavils–all six of them–are prodigious multi-instrumentalists, pulling down an instrument list that reads like they're planning to open their own music shop. Mark Steudel (fiddle, mandolin, guitar, banjo, harmonica, vocals) heads up the band with his fiery fiddling, adept at both bluegrass solos and the tricky brinksmanship of his own original tunes. Lead vocalist and washboard player dave Grout has a rich baritone honed from years in choirs, and a mean hand on the washboard, bringing this old instrument far from its washerwoman roots. Mark Myers came out of the Bay Area bluegrass scene (playing with the likes of Vassar Clements) and brings that kind of well-honed precision to his dobro, steel guitar, and harmonica playing, cutting in and out of the tunes with perfectly aimed solos. Rhythm guitarist and harmony singer Pete Thorn and bassist Mike Karbowski have the chords that tie the rest of the band together, wrapping up the music in a rock- solid framework. Finally, Greg Lawless is the heart and soul of the group, an Irish left-handed banjo-picking lawyer who absorbs the brunt of all folk music jokes in the band. 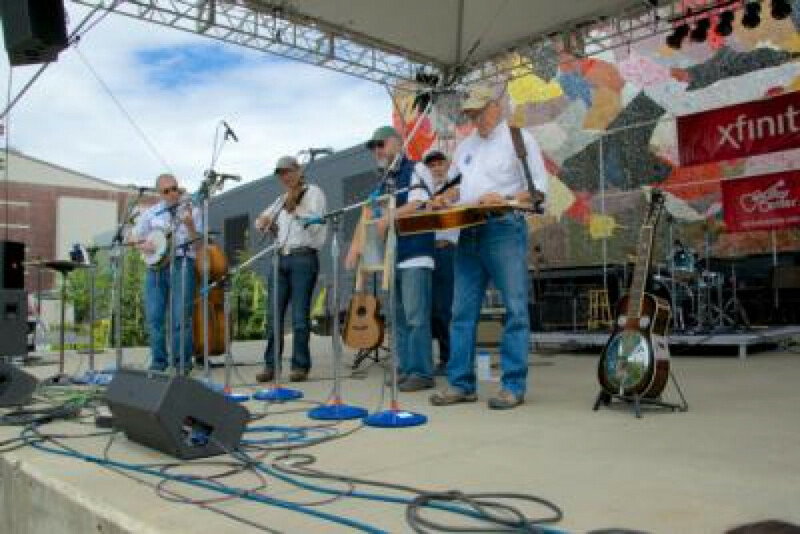 With six members and many years of combined experience in American roots music, it's no wonder that the Weavils are known for their fiery live performances. On stage and in the studio, The Weavils weave their way through a maze of influences, never losing sight of the roots that inspire them. It's all tied together by the essence of the best jam sessions: the relaxed fun of making great music with great friends. The Weavils don't polish off the edges of this music, instead, they revel in the rough and rowdy nature of roots music, tied to the past but not beholden to a stuffy interpretation. Their music is vibrantly alive, hooting and hollering its way into a new age. For a full schedule of all activities please visit the website. Have fun!